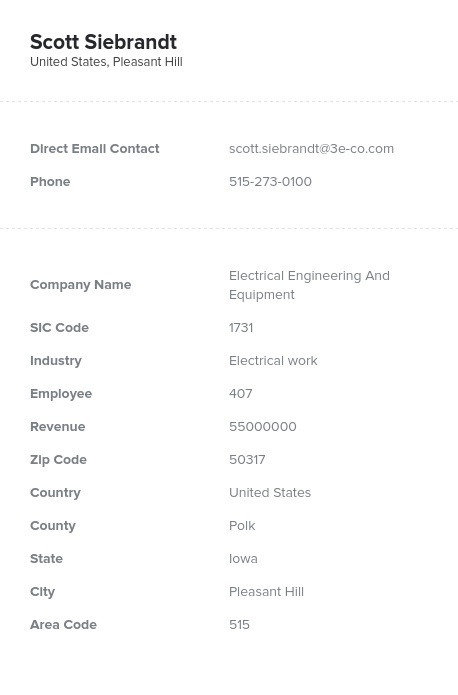 Electrify your next business-to-business (B2B) marketing campaign with this shockingly easy-to-use email database and list of electrical contractors from Bookyourdata.com. We list electrical contractors’ information in one ready-made contact directory, so you can find and start connecting with electricians within minutes. Look up those in the electricity industry today! Give your next marketing campaign a little "zing" by getting a more accurate list of potential sales leads full of the business contacts who would be most interested in your company and its products: electricians. With Bookyourdata.com, you can have a pre-built electrical contractors list full of the top names in the industry consolidated in one simply organized, human-verified prospect list. Our targeted electrical contractor list is also current; it's updated every day. Find the people you need to speak to now. Electricians and their companies are focused on safety. Dealing with dangerous and fast-moving electricity means that they need the best safety tools, training programs, and maintenance standards out there. With this affordable electrician email database, you can tell them about your product, service, or tool and help them do their jobs safely and more efficiently. Bookyourdata.com's pre-built electrician list is the perfect B2B marketing tool for communicating with a niche construction, safety, and maintenance community of highly qualified professionals. Communicate with this group after pulling this unique, premium electrician mailing list. Downloading and integrating it is easy and lightning-fast! Get this pre-built email list of electricians, or experiment with our free-flowing build-a-list tool to create your own customized leads list. Buy an email list of electricians so that you can email leads that are interested in the products, services, or tools provided by your business. Get in touch with electricians and electrical companies now!